A rental resort community, Bear Creek Crossing is bursting with amenities, spectacular views and is conveniently located. Rental resort communities are the best option for a maximum return on investment for rental homebuyers, though there are some factors to keep in mind. Homes primarily used as rental homes have fewer closets, less storage, and often don’t have garages at all. Renters don’t highly value these features, and so their absence isn’t noteworthy and doesn’t adversely affect the potential rental income. 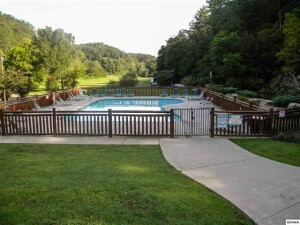 The gated resort community of Bear Creek Crossing has numerous amenities. From walking baths and a scenic covered bridge to the gorgeous scenic mountain views around each bend, there are plenty of quiet places for reflection and meditation. 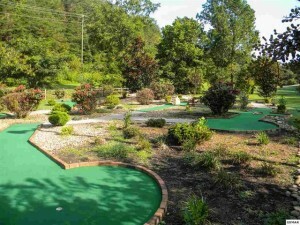 The children’s play area, 9-hole miniature golf course, outdoor pool and indoor heated pool offer endless varieties of family fun with a mountain views .A 65-foot waterfall trio at the entrance overlooks the outdoor pool; a creek that gently flows through the neighborhood provides another water feature. The clubhouse, available for rent for reunions and large gatherings, is yet another amenity. The assortment of log cabins situated in Bear Creek Crossing range in size from one bedroom to more than five bedrooms. The stone chimneys, smooth logs and green rooflines provide neighborhood cohesion. A lumber farm style fence, well-manicured trees, and a wide, paved road lead guests through the neighborhood. Large porches and strategically placed windows allow the scenic views to be taken in from every angle. Each home is especially built to take in the view. Location is highly important for rental communities and permanent residences alike. Bear Creek Crossing is less than three miles from The Parkway in Pigeon Forge, 25 minutes to the Great Smoky Mountains National Park, and 20 minutes to Dollywood, Sevierville’s favorite theme park. These rental homes are just a short drive from all the excitement and fine dining options in Gatlinburg. Are you interested in owning an investment home in Bear Creek Crossing? The Terrell Team can guide you to the perfect home. If you’re looking for a permanent residence, our real estate team is well acquainted with the Smoky Mountain region, from distressed properties to your dream cabin. Whether you’re searching for a home in Sevierville, Pigeon Forge, or Gatlinburg, the Terrell Team can help you find the perfect fit.